Attorney General Josh Shapiro’s investigation into the Pittsburgh Water and Sewer Authority resulted in 161 criminal charges. The attorney general charged PWSA for failing to notify residents when the agency replaced lead water lines, creating health risks for affected households. In addition, the authority was charged with failing to sample water lines following the replacements within the time frame required under state law. Attorney General Shapiro conducted a thorough investigation into the deficiencies at the PWSA and we applaud him for ensuring that there is accountability for those deficiencies. It was the same concern for the public that lead us to enact legislation placing the PWSA under the oversight of the Public Utility Commission in 2017. Act 65 of 2017, which was legislation I authored to place PWSA under the oversight of the Public Utility Commission (PUC), went into effect in May of 2018. Over the last several years, PWSA was faced with many servicing issues. They include multi-million-dollar debt and uncollectible accounts, unmetered accounts, incorrect billing, system leaks, and thousands of lead service lines, many of which have not been identified or located. They have been cited with non-compliance by the Environmental Protection Agency for Clean Water Act violations. These issues call into serious question the sustainability of PWSA and the health and safety of those served by the system. PUC oversight is crucial to correcting the authority’s long-standing difficulties. The PUC has the power to demand sound financial practices, systemic upgrades to infrastructure and reliable service delivery to customers. That’s why it is imperative for us to make lasting change within the agency. 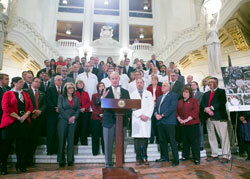 This week, at a press conference in Harrisburg, House Republicans called for a public hearing to help save our health care. 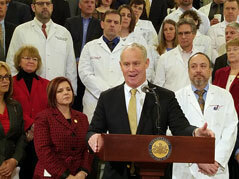 Pennsylvania residents may soon face a crisis in health care, if the state courts repeal a rule that helped stave off a similar crisis more than a decade ago. The rule, which I spearheaded in 2002, currently requires medical malpractice cases to be brought in the county where the alleged malpractice occurred. Repealing that rule could lead to patients having to say goodbye to their physicians or patients having to drive farther for care. Additionally, recruiting physicians and specialists would be difficult, and medical innovations may be halted. Please watch my remarks by clicking here. To learn more about the issue click here. To learn more about the potential negative impact this rule repeal could cause, the House Majority Policy Committee will hold a public hearing on Feb. 12 in the Lehigh Valley. On Friday, Feb.15, area veterans are invited to attend veterans’ assistance hours at my district office in McCandless. A representative from the American Legion will be at my office to assist veterans and their families. Through this outreach, we are able to provide some direct links between our veterans and the services and programs available just for them. An appointment must be made by calling 412-369-2230. More information can be found online at RepTurzai.com. My district office is located at 125 Hillvue Lane, first floor, in McCandless. 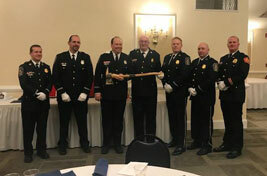 Recently, I had the pleasure to be the guest speaker at the Highland Volunteer Fire Department’s 92nd Annual Awards Banquet. 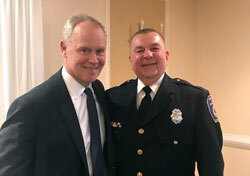 Congratulations to Andy Mesaros, pictured with me, who was named Firefighter of the Year. Also, Norm Voegler is the new chief succeeding Shawn O’Brien who retired after five years of service. Thank you for caring about the people of the 28th District. Applications for the Property Tax/Rent Rebate Program are now available on my website, and at my district office in McCandless. To be eligible, homeowners must earn less than $35,000 a year and renters less than $15,000 with half of Social Security income excluded. Certain supplemental rebates can boost homeowner rebates up to $975. The supplemental rebates are automatically calculated by the Department of Revenue for qualifying homeowners. 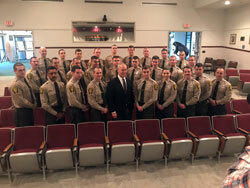 This week, I had an outstanding time speaking to the Wildlife Conservation Cadets who will be graduating next month. This is a career that provides many opportunities to perform interesting and rewarding work. 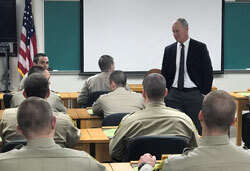 Officers begin their career as cadets assigned to the Ross Leffler School of Conservation, the Game Commission’s training school located in Harrisburg, and are required to complete the training program there. Classes are normally formed every two or three years or as necessary to maintain the complement of officers in the field. Congratulation Cadets and thank you for your service.